TS LAWCET/TS PGLCET 2019 Phase II Certificate Verification Dates for Web Counselling for Law Courses Admissions, TS LAWCET 2019 Web Counselling Schedule,Certificate Verification Dates, TS LAWCET 2019 Admissions 2019, Seats allotment, Counselling Dates, PGLCET and LAWCET Counselling Schedule, TS LAWCET 2019 Web Options. LAWCET 2019 Counselling Delayed, Updates soon on lawcet.tsche.ac.in: Telangana State Law Common Entrance Test, TS LAWCET has delayed the counselling of Law students who had applied for LLM and regular courses in Telangana Law Colleges, 2019-2020. The date has not been released yet. The academic year for TS LAWCET 2019-19 was supposed to begin in August, 2019, but there has been no confirmation regarding Counselling process till now. Candidates may check the official website for further updates on lawcet.tsche.ac.in. So, the qualified and eligible candidates of TS LAWCET/TS PGLCET-2019 Examinations are informed to attend certificate verification for Web counseling for admission into LL.B (3-year course) and B.A.,LL.B(5-year integrated course) & LL.M courses for the academic year 2019-2020 as per the schedule given below at any one of the following Help Line centers. 3. University P.G College, SP Road, Near Paradise metro station, Sec-bad. 1. Directorate of Admissions, Kakatiya University Campus, Warangal. 11. Aadhar Card or any other valid I.D. proof. 3 - year LL.B : Candidates should have passed any Graduation (10+2+3 pattern) of a recognized University with 45% of aggregate marks or any other examination recognized as equivalent by the Universities concerned. 44.5% or more shall be rounded off and treated as 45%. The candidates who have less than the prescribed percentage but have secured the same percentage or more on the aggregate in any PG Degree (Masters Degree) or B.Ed. are eligible. The candidates who have passed Degree examination by single sitting without undergoing three years course either through regular or private or correspondence and those who obtained the degree through open University directly without having any basic qualification are not eligible. 5 - year LL.B : Candidates should have passed 2 - year Intermediate Examination (10+2 pattern) with 45% of aggregate marks or any other examination recognized as equivalent by the University concerned or the Board of Intermediate Education, T.S./A.P. 44.5% or more shall be rounded off and treated as 45%. Candidates have to pay a non-refundable processing fee of Rs.800/- (and Rs.500/- in case of SC/ST) at the time of certificate verification. The fee has to be paid at the counseling centre. i. There is a relaxation of 5% of marks in the above qualifying examinations for 3 year / 5 year Law course in favour of the Candidates belonging to SC / ST.
ii. The applicants who have obtained 10 + 2 or Graduation / Post graduation through open Universities without having any basic qualification are not eligible for admission into LL.B Courses. LL.M: Candidates should have passed LL.B/BL from a recognized University. b. Special category candidates educational certificates will also be verified simultaneously at the Centre. 1. This notification itself is a call for counseling. No separate call letters shall be sent to the individual candidates. 2. Mere attendance at the counseling centre does not guarantee a seat. 3. The students belonging to SC/ST/BC/EBC/Disabled/Minority categories will be considered for Reimbursement of Tuition Fee. However, it is subject to verification and eligibility criteria prescribed by the State Governments of Telangana. Tentative fee payable now is subject to fulfilment of eligibility criteria; in case found not eligible the candidate shall pay the difference of fee. 4. Special category candidates (NCC / CAP / Physically Handicapped) for all courses LL.B 3years, LL.B 5years and LL.M are directed to attend Certificate Verification only at AV College of Arts, Science& Commerce, Gagan Mahal, Hyd at 9:00 AM. 4. Changing Web Options: The Candidates desired to change their options can change only on ...10.2019 upto 5:00pm. The list of Colleges is available on the website http://lawcetadm.tsche.ac.in. CAP - The children of Armed Forces, e., Ex. Servicemen, Defence Personnel including the Children of Border Security Force and Central Reserve Police Force who are domiciled in Telangana based on the Permanent Address/Home Town declared by them while joining the service and as recorded in their Service Register are alone eligible to be considered under “CAP” Category. Certificate issued by Zilla Sainik Welfare Officer, Identity Card and Discharge Book in case of Ex- service Men and Service Certificate in case of Servicemen issued by the Competent Authority shall be produced at the time of Certificate verification. NCC & Sports - To produce Original Certificates issued by competent authorities. Minorities: Copy of SSC TC containing Minority Status or Certificate from the Head Master or competent authorities. READ | How to give TS LAWCET Web Options on LawcetAdm.Tsche.Ac.In? The entrance examination for admission into three-year, five-year and PG law courses was conducted by Osmania University on behalf of the TSCHE on May ... Thought the results were announced on June .., the delay in issuance list of affiliated colleges by the Bar Council of India had put admissions on hold. For the three-year course, 12,960 candidates had appeared, out of which 89.22 per cent qualified. Similarly, in the five-year course, 64.42 per cent of the 3,727 candidates qualified. For PG LAWCET, 1,860 candidates took the test and 98.33 per cent cleared it. A total of 2,880 seats in LLB, 968 in LLB-five year course and 553 in LLM courses in 21 law colleges, including 17 private and four universities, are up for grabs this year. A detailed notification will be made available on the web site http://lawcetadm.tsche.ac.in and http://lawcet.tsche.ac.in. TS LAWCET is a common entrance test conducted for admission to the Three year and Five year LLB course. The Results have already been announced in June, 2019. Around 16, 000 candidates have applied and are waiting for the counselling sessions to begin soon. The TS LAWCET is held on behalf of the telangana State Council of Higher Education by the convenor, Osmania University, Hyderabad. Students are suffering because of delayed in Counselling. Students applied for the TSLAWCET in March and gave the examination in May but till date the counselling process has not begun in the state. The academic year is supposed to begin in August but still there is no sign of the counselling process. If the course is delayed they will suffer as there will be a hurry to finish the syllabus. They demand that the counselling process begins as soon as possible. TS LAWCET 2019 Certificate Verification Dates: Kakatiya University, Warangal issued the Telangana State Law Common Entrance Test (TSLAWCET) 2019 and Telangana State PG Law Common Entrance Test(TSPGLCET) 2019 notification on March .., 2019. The University invited the applications through online mode from the eligible students for admission into 3 or 5 years law courses(LLB) through TSLAWCET and admission into LLM courses through TSPGLCET offered by state universities in Telangana State including their affiliated colleges for the academic year 2019-2020 as per its schedule. LAWCET Counseling will begin soon. LAWCETresults were announced in the second week of June. The Telangana State Council of Higher Education has written a letter to the Bar Council of India (BCI).. Recently colleges checks have been completed in this order. Academic Chairman said that counseling will take place with in couple of days. TS LAWCET/PGLCET 2019 Phase II Schedule for Certificate verification is on 14th Nov 2019 and exercising web options is on ............ Nov 2019. 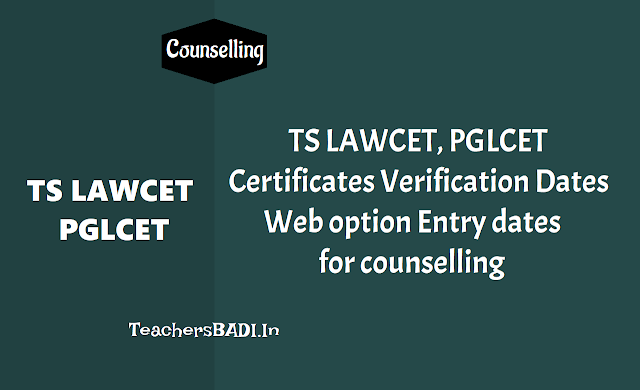 The qualified and eligible candidates of TS LAWCET/TS PGLCET-2019 who have participated Web Options in I Phase can again exercise the web options if required, and those who have not attended the first phase Certificate Verification are informed to attend certificate verification and web Options for admission into LL.B (3-years courses) and BBA LL.B / BA LL.B / B.Com LL.B (5-years integrated courses) & LL.M courses for the academic year 2019-19 as per the schedule given below at any one of the following Help Line centers. 1. Who should participate in Phase-II ? b. Candidates who participated in earlier phase of web based counseling and could not secure a seat. arise due to sliding, cancellation and conversions. 3. If the candidate secures a seat in phase – II, he / she will lose the claim on the earlier allotted college, and has to report to the new college by downloading the allotment letter on or before the date furnished in the allotment letter. Failing to report within the date furnished in the allotted college, the candidate will forfeit the claim on the new college as well as on the old college. The candidates, who were applied for this entrance tests, they were attended the law entrance exam ...../05/2019 and results were announced. Now the LAWCET 2019 qualified candidate are waiting for their LAWCET counselling dates(schedule) for admission into law courses. Sri Venkateshwara University officials has announced the TS LAWCET / TS PGLCET 2019 Counselling dates on September ...., 2019 through press media. The certificate verification in Helpline centers. List of Help Line Cneters, detailed procedure of web based counseling, admission procedure and list of colleges are provided here. So, the candidates who are qualified in the entrance test 2019 are ready for this LAWCET counselling 2019. Candidates should collect all the required certificates and documents for this counselling. The qualified and eligible candidates of TS LAWCET/TS PGLCET-2019 Examinations are informed to attend certificate verification for Web counseling for admission into LL.B (3-years courses) and BBA LL.B / BA LL.B / B.Com LL.B (5-years integrated courses) & LL.M courses for the academic year 2019-19 as per the schedule given below at any one of the following Help Line centers. 1. This notification itself is a call for counselling. No separate call letters are sent to the individual candidates. 2. Mere attending counselling does not guarantee a seat. 3. The students belonging to SC/ST/BC/EBC/Disabled/Minority categories will be considered for Reimbursement of Tuition Fee is subject to verification and eligibility criteria prescribed by the State Governments of Telangana. Tentative fee payable now is subject to fulfilment of eligibility criteria; in case found not eligible the candidate shall pay the difference of fee. 4. Special category candidates (SPORTS / CAP) for all courses LL.B 3years, LL.B 5years and LL.M are d irected to attend Certificate Verification only at Nizam College, Basheerbagh, Hyderabad on 23-10-2019 at 9: 00 AM and Special category candidates (NCC / Physically Handicapped) for all courses LL.B 3years, LL.B 5years and LL.M are directed to attend Certificate Verification only at Nizam College, Basheerbagh, Hyderabad on ...-10-2019 at 10: 00 AM. plz give counselling dates of tslawcet.we r waiting eagerly. Can you give info about what is study certificate.What we need to get to counselling.I studied here from class 6 and lived in TS since 10 years.Can I instead get marks memo from class 6 to 12 or this study certificate is something different. PLS Explain in detail. Sir what if I miss the certificate verification date?? Do I have an option to verify later?? Any update on TS LAWCET 2017 web counseling dates for 3 year LLB course?